As the date of the EU referendum draws ever closer, it is timely for companies to seriously consider the advantages and disadvantages of a ‘Remain’ or ‘Exit’ vote. Holman Fenwick Willan is reviewing business issues related to our key sectors to help clients prepare for a possible EU exit. We have extensive experience of working with clients on EU, competition and regulatory matters, including EU/national antitrust and merger control, State aid, EU litigation and EU and regulatory law matters. 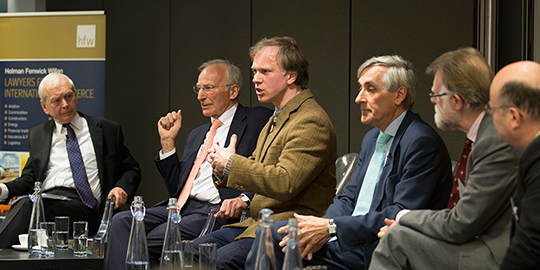 The discussion opened with the panel setting out their arguments for Britain remaining in the EU (Anthony Hilton and Derrick Wyatt) or leaving (John Redwood and Andrew Lilico). "The only proper destination for the EU is the creation of a single functioning EU state and the UK will be dominated by that asymmetric relationship." stated Andrew Lilico, "The EU has made great steps to solve geo-political problems by incorporating post-fascist countries, but these opportunities are now exhausted. There are new and exciting opportunities outside of the EU and with the rest of the world for the UK to enjoy". Much of the discussion focused on the issue of sovereignty, John Redwood stated "'I want to take back control over money, over who we invite to be a citizen, over our law making and our taxes". He cited the bail out of Greece as a key factor of the leave argument saying: "We shouldn't bail out any Eurozone country. Greece would have been better off if they had come to a sensible economic solution at the time, rather than a bailout. Had they done so, by now they might be having a proper economic recovery". Another key theme which emerged focused on 'Britishness' versus 'Europeaness', with John Humphrys asking "why must it be distinguished, why can't we all be part of one happy family?". Derrick Wyatt deemed himself to be a "strong advocate of 'Britishness'" which he defined as "based on our constitutional framework, with an emphasis on democracy, pragmatism and the existence of rules”, but he added that "'Britishness' and 'Europeaness' have much common ground... with the differences between the two being exaggerated". 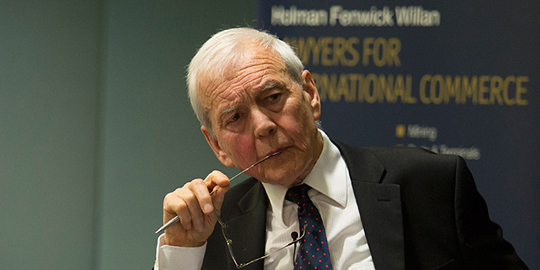 The panel agreed to an extent that the idea of Britishness is a generational view and Anthony Hilton stated, tongue in cheek, that "the vote is concerned with the long-term effects in 30 years time and as such, nobody over the age of 60 should be able to vote". Moving to a focus on business, Andrew Lilico believes the majority of business people will wish to maintain the status quo and vote to stay in the EU, not because it is the 'right' thing to do, but because UK business infrastructure is so aligned with the EU that to change this would be difficult, time consuming and most importantly, expensive. With a final show of hands from the audience, John Humphrys concluded that "the 'ins' have it, but by the time you add the 'don't knows' it's an open contest! ", cementing his initial comment that "people genuinely don't know which way to go which is surprising at this late stage of the campaign". Anthony Woolich echoed the sentiments of all panel members imploring the public to seek out information from a range of views and "to trust that our great nation will make the right decision". If you have any queries regarding this event, please contact us at href="mailto:events@hfw.com"> events@hfw.com.